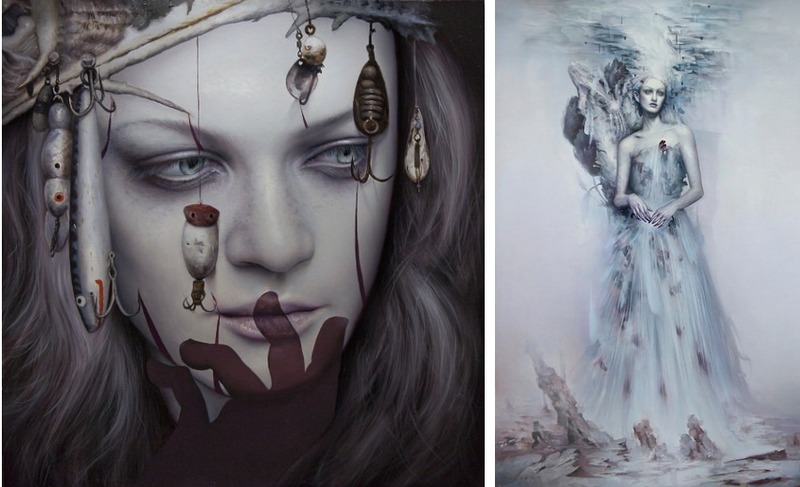 Completely self-taught, Los Angeles-based artist Dan Quintana channels a style strongly reminiscent of the famous Hieronymus Bosch, only with a modern twist. Quintana ’s tones, brushwork and overall technique pays homage to the great 13th-century master while the subject matter separates his work from the one of his stylistic mentor. Dan’s art is original and exciting, a truly refreshing body of work that places highly stylized and well-depicted figures in an ethereal universe. A Los Angeles native, Dan Quintana began experimenting with oil painting in high school before shifting his focus to street art. He was then creating numerous murals, many of which can still be seen around his home city. In his early twenties, Quintana started to accept commercial commissions for numerous music labels and tee-shirt designs, which in return offered an opportunity to become a full-time artist. 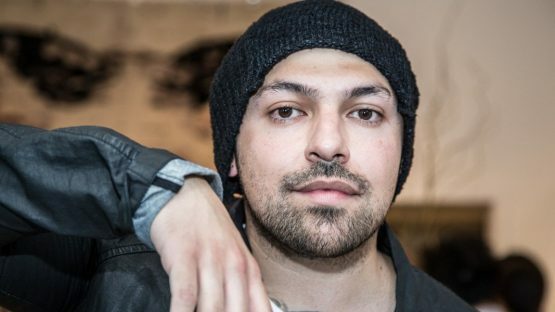 Since then, Dan has been featured in various publications, including LA Weekly, Juxtapoz, Hi-Fructose and more. He was also an artist for West Coast Customs on the MTV show Pimp my Ride and TLC’s Street Customs. However, Quintana’s private pieces were the definite highlight of the young man’s career despite the fact he was a part of many successful shows and publications. For the majority of his life, color and light played important roles in Quintana’s work – this goes for both his street and more gallery oriented works. Most of his paintings are muted in shades of gray and brown, invoking a look that’s both antique and corpse-like – in Quintana’s opinion, light is a symbol of life. Furthermore, Dan’s outlines are obscured and partially dissolved, making it unclear where the forms begin and end. For his latest body of work, presented in a show called Tidepools and held at the Spoke Art Gallery, Quintana has drawn inspiration from tide pools and their extreme conditions – while organisms must avoid the dangers of their own habitat, they are simultaneously dependent on the tide pool’s constant fluctuations for sustenance. Life and death are precarious in these environments, and survival is contingent on the ability to adapt rapidly. These Quintana’s thoughts resulted in dreamy compositions that delve into the artist’s already familiar themes of life and death. Interestingly, Dan’s work challenges viewers to delve into their own subconscious, inviting them to complete the narrative for themselves. Most of Dan’s recent projects are series of paintings with a dark and macabre tone – most of them have female figures with haunted eyes that observe the viewer from within the composition. Furthermore, the figures are often horribly disfigured as Quintana strips away flesh from his subjects, revealing grisly anatomies of muscle and bone. Underlined by heavy topics such as death and decay, these images are just the latest way Quintana channels the otherworldly imagery of Dutch painter Hieronymus Bosch. We are excited to see what Dan Quintana has in store for us next as his ability to blend modern motifs with semi-conventional visuals encourages us that this artist will continue to develop his style and turn his body of work into an even more impressive collection of paintings. This artist is represented by Spoke Art Gallery. 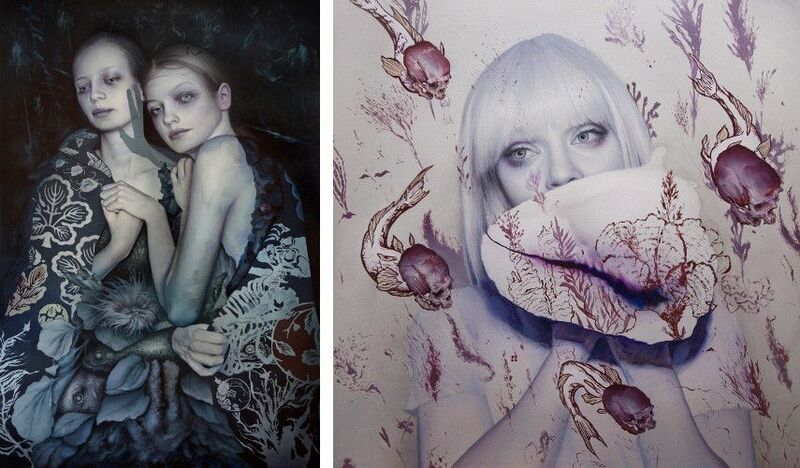 Dan Quintana lives and works in Los Angeles, the United States. All images courtesy of Spoke Art Gallery.